In June 2013, U.S. Department of Housing and Urban Development (HUD) launched Rebuild by Design (RBD), a competition to respond to Superstorm Sandy’s devastation in the northeast region of the United States and promote a design-led approach to proactive planning for long-term resilience and climate change adaptation The winning proposal would be implemented using CDBG-DR funding as well as other public and private-sector funding resources. In June 2014, following a year-long community-based design process during which the design teams met regional experts, including government entities, elected officials, issue-based organizations, local groups and individuals, HUD announced the winning proposals. 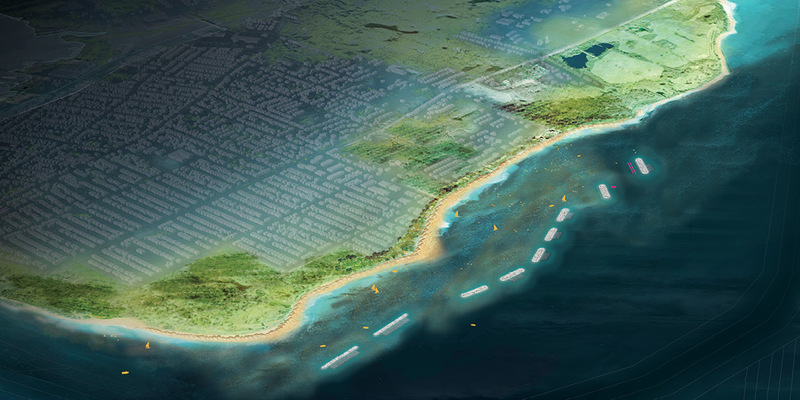 The Staten Island Living Breakwaters Project which proposed a layered resiliency approach to promote risk reduction through erosion prevention, wave energy attenuation, and enhancement of ecosystems and social resiliency, was one of the selected projects. As a result, New York State has been allocated $60 million of Community Development Block Grant Disaster Recovery (CDBG-DR) funds to implement the project along the Tottenville shoreline of the South Shore of Staten Island. With an ecologically enhanced breakwater system to address wave energy and shoreline erosion at Tottenville, this project also fulfills New York City’s Resilience Plan Coastal Protection Initiative 15. PROJECT PURPOSE: WHY LIVING BREAKWATERS? Risk Reduction: address both event-based and long-term shoreline erosion in order to preserve or increase beach width; attenuate storm waves to improve safety and prevent damage to buildings and infrastructure. Ecological Enhancement: Increase the diversity of aquatic habitats in the Lower New York Harbor / Raritan Bay (e.g., oyster reefs and fish and shellfish habitat), particularly rocky / hard structured habitat that can function much like the oyster reefs that were historically found in this area. Social Resiliency: Provide programming that builds a community around education on coastal resiliency and ecosystem stewardship; foster and encourage community stewardship and citizen science, and increase physical and visual access to the water’s edge and near-shore waters for recreation, education, research, and stewardship activities. The need for enhanced erosion protection, wave attenuation, and social resiliency were demonstrated during the severe storm events of 2011 and 2012 (including “Superstorm Sandy”) when the Tottenville community experienced severe damage from storm waves. In addition to storm events, the shoreline has experienced ongoing erosion over the last 35 years. While shoreline change patterns oscillate between erosion and accretion, most of the shoreline in the project area has experienced erosion. In many locations erosion rates average more than one foot per year and in one area of Conference House Park they reach an average rate of more than three feet per year. The need for habitat enhancement within Raritan Bay has been well documented through ecological assessments and reports initiatives including National Marine Fisheries Service Raritan Bay habitat evaluations and the New York State Department of Environmental Conservation Shellfish Assessments to the Food and Drug Administration in support of their northern quahog (Mercenaria mercenaria) fishery. Additionally, the Hudson Raritan Estuary Comprehensive Restoration Plan (HRE CRP) states that, "The most effective way to sustain or increase fish and macroinvertebrate populations in the HRE may be to restore and/ or create mosaics of critical habitats to provide what habitat was historically lost (i.e. intertidal wetlands, eelgrass beds, oyster reefs, etc. ), as well as expand upon existing habitats (e.g. subtidal shallows, rocky intertidal)." 1. US Army Corps of Engineers, Port Authority of NY & NJ, and NY-NJ Harbor Estuary Program: Hudson-Raritan Estuary Comprehensive Restoration Plan - Version 1.0, June 2016, p. 101. PROJECT OVERVIEW: WHAT ARE LIVING BREAKWATERS? Living Breakwaters is an innovative coastal green infrastructure project that aims to increase physical, ecological, and social resilience. The project is located in the waters of Raritan Bay (Lower New York Harbor) along the shoreline of Tottenville and Conference House Park, from Wards Point in the Southwest to Butler Manor Woods in the Northeast. The project area is a shallow estuary that has historically supported commercial fisheries and shell fisheries. In October 2012, Superstorm Sandy devastated Staten Island’s east and south shore neighborhoods. The driving wave action battered the coastline, damaging or destroying an unprecedented number of Staten Island homes and businesses, resulting in loss of life and significant harm to the local economy. Tottenville, a community at the southernmost point of Staten Island, experienced some of the most destructive waves in the region. Historically known as “The Town the Oyster Built,” the community was once protected by a wide shelf and series of oyster reefs, which in turn supported a robust oyster farming industry. Over time, due to siltation, overharvesting, channel dredging and human pathogens in the water, the once abundant oyster reef collapsed. Today, the Raritan Bay lacks not only the oysters, but the complex habitat their reefs provided and the species richness and biodiversity that they supported. Without these natural systems, the shore of Staten Island remains exposed to wave action and coastal erosion. Living Breakwaters: Approximately 3,200 linear feet of near-shore "breakwaters," or partially submerged structures located between 730 and 1,200 feet from shore, designed not only to to reduce risk, but also to provide habitat enhancements through the specialized design of the breakwater structures and the materials used. Shoreline Restoration: Placement of sand from Manhattan Street to Loretto Street, where the distance between the shore and the buildings is most narrow and subject to erosion. Active oyster restoration by the Billion Oyster Project: This will include installations on the breakwaters themselves, a floating oyster nursery, as well as off-site oyster cultivation activities (hatcheries, remote setting, etc. ), shell collection and curing. A Water Hub: A floating vessel to house educational, monitoring, and stewardship activities, as well as an on shore experience consisting of interactive elements. Programming: This will include educational, stewardship, and workforce training activities related to the other project elements. 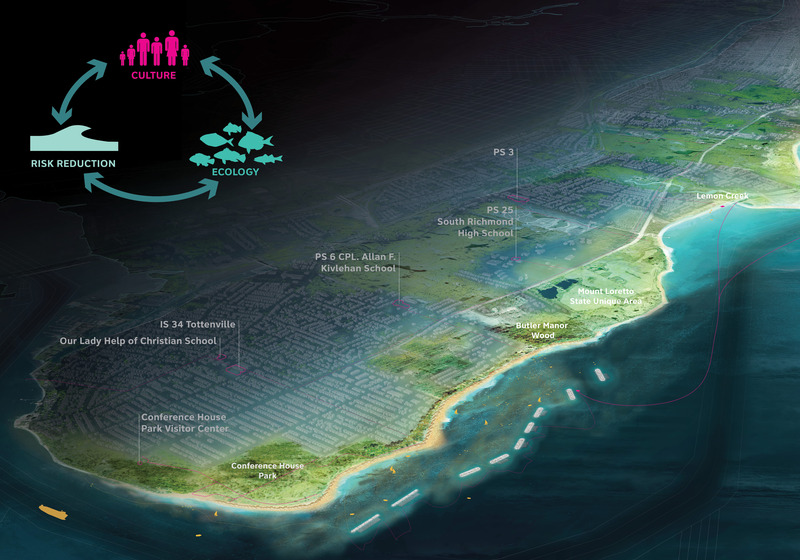 The project is taking a thematically and spatially layered approach to reducing coastal risk, restoring and enhancing habitats important to local ecosystems, improving waterfront access, and engaging with residents through community and educational programs directly related to the project’s coastal and ecological resilience actions. The project is consistent with New York City’s Coastal Protection Initiatives and planning studies for the Tottenville area as well as the New York – New Jersey Comprehensive Restoration Plan for New York Harbor (HRE-CRP). The breakwaters are designed to reduce wave energy, and reduce or reverse shoreline erosion in the project area. Extensive modeling efforts are being performed to understand the potential impacts of the breakwater system on shoreline change in order to maximize risk reduction and erosion benefits while minimizing negative environmental and aesthetic impacts. 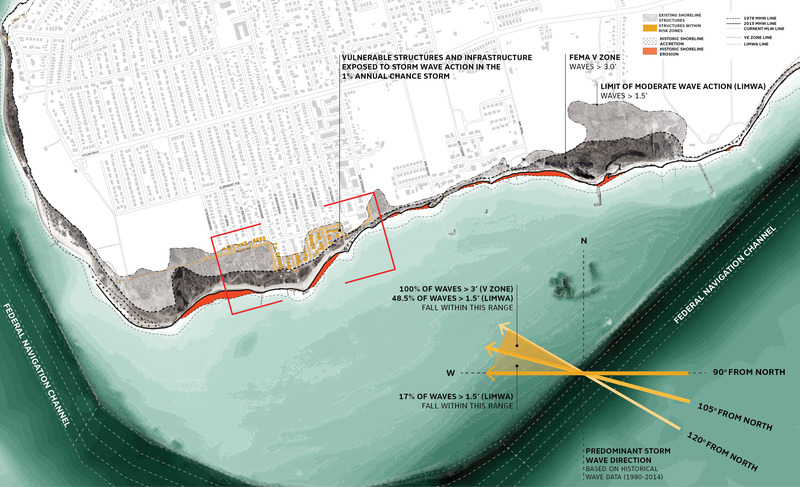 The breakwater system has been designed to capture sediments along the shoreline, reducing historic shoreline erosion and in most places widening the beach over time. This wider beach will provide additional protection from erosion and wave action to on-shore coastal protective features and other assets. The project approach to storm wave attenuation is to focus design for storm wave attenuation in areas where existing structures and infrastructure are susceptible to wave damage from high-intensity / low-frequency storm events. The design storm considered is the 1% annual chance (100-year) storm event with 30” of sea level rise. According to the currently available FEMA preliminary flood insurance rate maps (pFIRMs), the area between Brighton Street and Sprague Avenue contains structures (buildings and infrastructure) within the Limit of Moderate Wave Action (LiMWA) and within the V zone during a 100-year storm event. Analysis of wave conditions at the project site provided through wave hindcast data transformed to the project area through numerical modeling, revealed that over the 30-year period, the largest significant waves come from the east and southeast. The breakwaters are designed to provide habitat and support biologic activity consistent with existing regional plans and priorities such as the Hudson Raritan Estuary Comprehensive Restoration Plan (HRE CRP) and generate net ecosystem benefits in the project area. Contrary to traditional rubble mound breakwaters, which often offer less diverse biological niches when compared to natural rocky shorelines (Chapman and Bulleri 2003, Burt et al. 2009), the Living Breakwaters are designed to avoid and minimize negative impacts and optimize habitat creation and ecosystem services. To avoid critical habitats, and to reduce the structures overall footprint, the Living Breakwaters are designed with minimized crest widths and reduced crest elevations where this is consistent with the project’s risk reduction goals. Steeper side slopes allow for a smaller footprint for the main breakwater while still being structurally sound and providing opportunities for ecological enhancement on surfaces within the intertidal and subtidal areas. The use of multiple breakwaters with small gap widths rather than long, continuous breakwaters also helps to reduce footprint sizes while creating additional habitat variety between the ends of the breakwaters. Closely spaced rocky intertidal / subtidal protrusions (reef fingers) create “reef streets” which add habitat complexity and dramatically increase the length of productive edge habitat. The integration of bioenhancing concrete units into the armor units of the main body of the breakwater segments as well as the reef streets adds greater range of crevice sizes and promotes biogenic buildup to further enhance the overall complexity and variety of the rocky habitat created. This further contributes to greater biodiversity and overall biological activity on and around the breakwaters. The inclusion of active oyster restoration on and around the breakwaters will provide additional variety and micro-complexity to the structure’s habitat, as well as help to achieve regional restoration goals (HRE CRP). Together, these strategies help the project maximize the ecological uplift provided and help offset any impacts to existing habitats or species. The following section provides a summary of the habitat benefits and potential impacts provided by the breakwaters. The calmed near shore waters and wider beaches created by the breakwaters will not only help reduce risk from coastal storms, but will also enhance recreational opportunities along the shoreline including boating, fishing, and general beach use. Also, programming and education are a critical part of the Living Breakwaters social resiliency project objectives, allowing for residents and visitors to engage with the shoreline, learn about resiliency initiatives and ecological restoration activities, and become stewards of the harbor. The programming for the floating Water Hub and shoreline interpretive elements are being discussed with GOSR, NYC Parks, and other agency stakeholders. Through multiple outreach events and Citizen’s Advisory Committee meetings, the design team has received feedback and additional programmatic ideas from community members and other engaged residents and advisors. The main programmatic themes that have been expressed are continuous water access along the shoreline, and increased ability to recreate along and in the water. More specific potential programs and activities will be further developed as the design progresses. Educational initiatives for the site – activities on the floating Water Hub– are being developed through the Billion Oyster Project (BOP). During 30% design, BOP has expanded its presence on Staten Island to include 14 schools, nine restoration stations and two pilot oyster nurseries. The breakwaters consist of series of ecologically enhanced breakwater segments off of the southwestern tip of Staten Island. Made of a combination of hard stone and bio-enhanced concrete armor units, the breakwaters are non-traditional rubble mound structures. The system has been designed to reduce or reverse erosion (grow beach), and reduce coastal storm risk through wave attenuation. 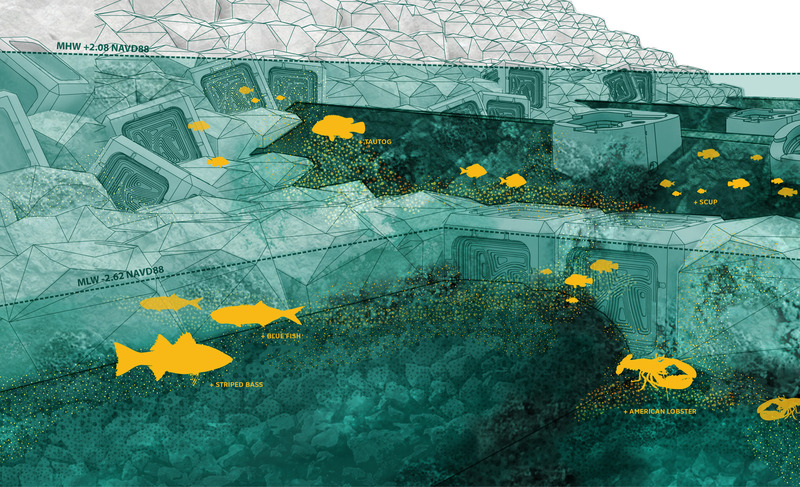 A network of ecological enhancements integrated into the breakwater’s physical structure (“reef streets” and “reef ridges” and water retaining elements) and targeted material selection (bio-enhancing concrete) are aimed to increase biodiversity by providing various ecological niches and improving the ecosystem services provided by structures. The project also proposes to include eastern oyster (Crassostrea virginica) active restoration on and within the breakwaters as well as an oyster nursery system (floats, anchors and oyster trays) and bottom placement of “spat” (juvenile oysters) attached to shells. The breakwater system will include approximately 3,200 linear feet of breakwaters. The breakwaters will be located between 730 and 1,200 feet from shore and in water depths of between two-and-10 feet below mean low water (NAVD88). In addition to the breakwaters themselves, design includes a limited strategic placement of shoreline restoration that will add needed sediment to the system and provide initial protection to the most vulnerable stretch of beach as the breakwaters work over time to accrete beach elsewhere. This layout design was refined through process of design and computer modeling, where scenarios were iteratively developed based on the information available, modeled to evaluate impacts on shoreline change and storm wave attenuation and the results analyzed to help inform the design refinement. The breakwaters will be primarily constructed as rubble mound (rock) structures with a stone core, a marine mattress layer to protect against scour and outer layers consisting of armor stones and bio-enhanced concrete armor units. The individual breakwater segments are basically the same in character and construction and made from the same materials. However, different segments may vary in crest elevation, overall height, length and distribution of materials. In the subtidal and intertidal areas approximately a third of the outer layer of stone armor units will be replaced with bio-enhanced concrete armor units. These bio-enhanced concrete units are structural armor units specially designed to promote biological activity and promote recruitment of marine species. This is achieved through both the specialized concrete mixture and the design of the textured surfaces of the units. 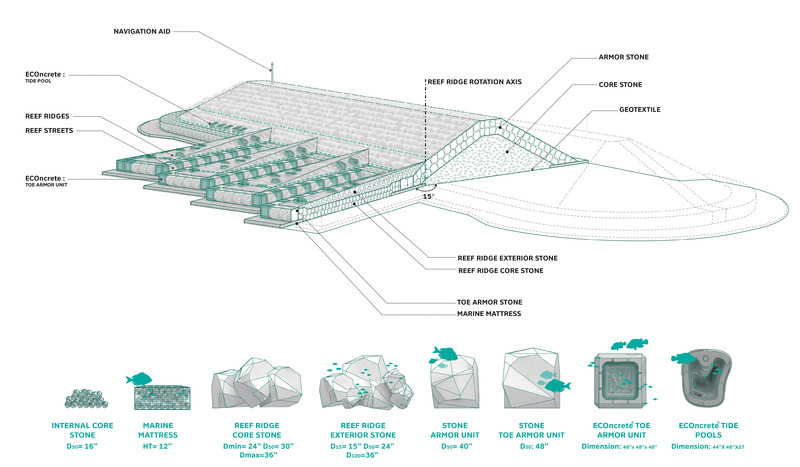 In addition to the main (traditional) breakwater segment, the living breakwaters are being designed to include “reef ridges”—rocky protrusions on the ocean-facing sides of the breakwaters—and “reef streets”—the narrow spaces between the reef ridges. These features will create localized modifications to wave behavior and provide a diversity of habitat characteristics to generate opportunities for species recruitment and ecological enhancement. Habitat diversity will be further enhanced on the reef ridges through greater variation in rock sizes and thus the interspaces between them, the textured surfaces of the bio-enhancing concrete tide pools, and the inclusion of bio-enhancing concrete tidepools in the intertidal zone. Active oyster restoration on and adjacent to the breakwaters will further enhance the habitat opportunities created by the breakwaters. Techniques will include the incorporation of spat placement into a small percentage of the bio-enhancing concrete units, the use of oyster shell gabions (non-structural units), spat on shell placed in the reef streets and adjacent to the breakwaters, oyster nurseries, and in-situ setting pilots. The oyster gabions will use the same design being employed in other oyster restoration projects in locations in the Harbor as part of the Hudson Raritan Estuary comprehensive restoration plan, spat on shell techniques will be based on techniques developed and deployed during the Oyster Restoration Research Project, and Oyster Nurseries will be based on designs developed and currently in place or being installed by the New York Harbor Foundation’s Billion Oyster Project at Govenors island, Wallabout Bay and Jamaica Bay. Oyster restoration will be implemented by the Billion Oyster Project. 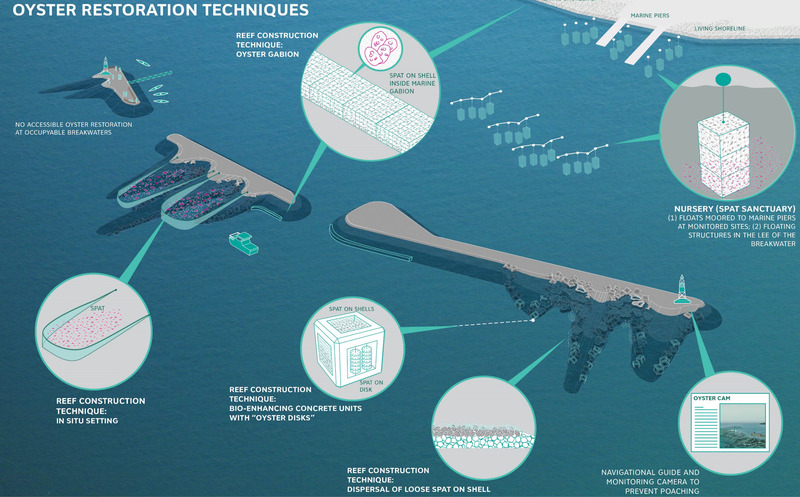 The Water Hub, consisting of both the floating vessel and on shore-elements, is an integral part of the Living Breakwaters Project. Together, these components will provide the educational and programmatic support necessary to introduce the Living Breakwaters Project to the surrounding community and visitors, provide resources and support to students and educators, and offer direct waterfront access and recreation opportunities. The floating Water Hub will join Richmond County Yacht Club, Hudson River Park, Lower East Side Ecology Center and other sites around New York City as a hub for activities organized by the New York Harbor Foundation’s Billion Oyster Project. On shore elements will support and enhance existing park activities, such as beach cleanup events, shore birding walks, Arbor Day activities, citizen science monitoring, and other ongoing programs. The budget amount submitted in the overall design proposal to the RBD Competition for the Living Breakwaters Project was approximately $74 million, and when selected for funding, received a Community Development Block Grant- Disaster Recovery (CDBG-DR) allocation of $60 million. Current estimates of the project costs remain relatively constant. The State is exploring other funding options to fill the unmet need. 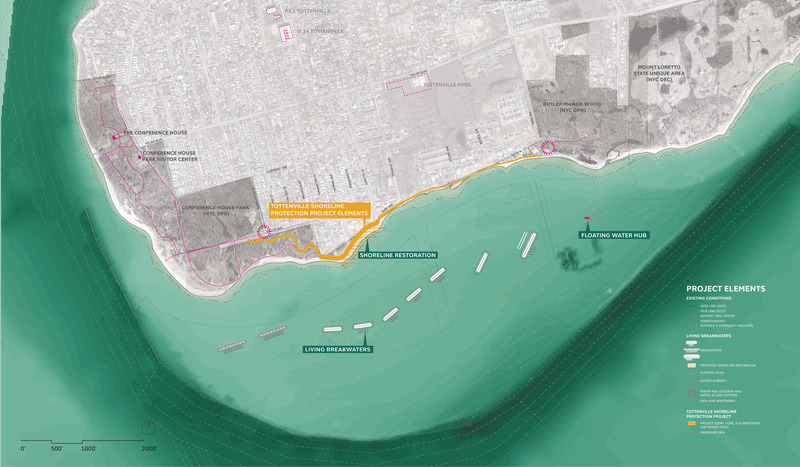 The State is currently in the final design phase of the breakwaters, and design is expected to be complete by the end of 2018. Because of ecological consideration, construction will not begin before mid-2019, with construction expected to be completed by the end of 2020. The project is undergoing Federal, State, and City environmental review. The Draft Environmental Impact Statement (DEIS) for the combined Living Breakwaters and Tottenville Shoreline Protection Project was published on March 24, 2017 and the public comment period ended on May 8, 2017 after a public hearing was held on April 26, 2017. The Final EIS, including responses to the public comments, is anticipated to be issued in the spring of 2018.